If you have mold & mildew, this product will work wonders for you. 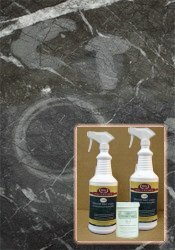 The mold & mildew stain remover is safe and effective to use on ALL Natural Stone. Cleans without scrubbing! Just spray it on and watch the mildew disappear with NO scrubbing. Use it to clean marble bathrooms, shower walls, or floors... use it anywhere that mildew is a problem! 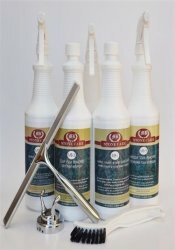 Regular use of this product keeps your surface clean and odor free. 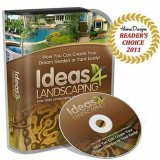 Great for the Marble and Granite contractor too! Power wash and rid outdoor stone and concrete of pollution and mildew. 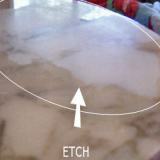 This specialty product was MADE for stone... even your most delicate. YET it's strong enough to clean AND stop the growth of the toughest fungi! Look at the picture below... we used the mildew stain remover in a power washer to get rid of mold sludge and dark mildewy stains in the concrete pool. It worked wonders! These tiny microscopic organisms are NO MATCH for this mold & mildew remover! 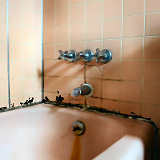 Just spray n' wipe... watch the mildew disappear. This specialty product is STONE FRIENDLY. Safely Clean Mold and Mildew Without Scrubbing!